Home Arts & Culture Hip-Hop, Women, Earth? Word. Photo used with permission of Mare Advertencia Lirika. The worlds of feminism, hip-hop and environmental justice will dance together April 29 at the Merrill Cultural Center. Hosted by the Romero Institute and the Conscious Flow Collective (CFC), “Word to Our Mother” will bring out local and international artists passionate about global issues. As conscious hip-hop will follow the tabling organizations, attendees will have the opportunity to learn about environmental and community issues, like finding ways to bridge the gap between hip-hop and at-risk youth. Mare Advertencia Lirika, a female rapper from Oaxaca, Mexico, will be headlining the event with support from local artists, Mesha L and Gina Rene, Babii Chris and DJ Phyzk. Mare, a fierce hip-hop artist rapping in Spanish, began her career 13 years ago in an all-women’s rap collective in Oaxaca — the first in the city’s history. 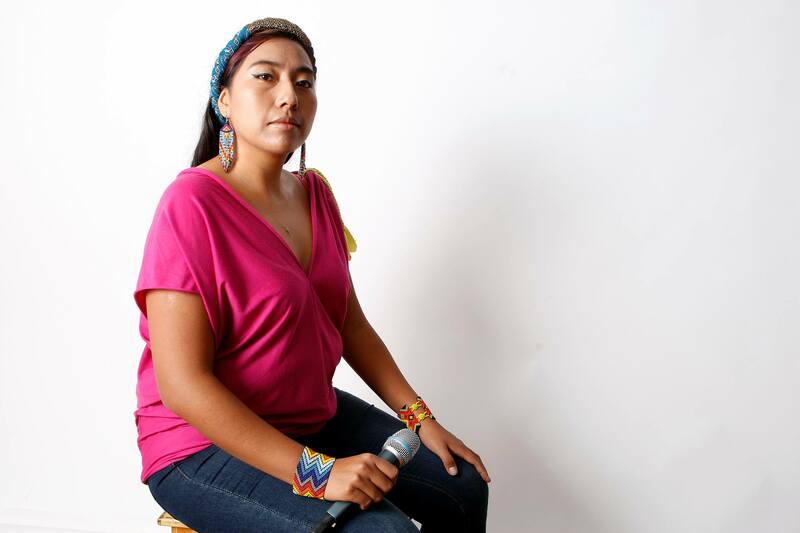 Her music brings to light political and social issues in Oaxaca, like women’s rights, prison injustices and land disputes. Mare’s hometown in Oaxaca is located 300 miles from Mexico City. It’s home to the largest population of indigenous people in the country, who make up 48 percent of the population. Many of these communities are under- resourced and marginalized, affecting everything from their agricultural production to their living conditions. Water is scarce in the city and its use is rationed. Due to increased exploitation through the transnational globalization of capitalism, living conditions are troubling, with single-story homes built with cement rocks in extremely close proximity to each other. Once the hip-hop group disbanded in 2009, Mare began pursuing a solo career that went from local to international fame. Three years later, she visited the U.S. for the first time on a screening tour of her documentary, “Cuando Una Mujer Avanza.” It was at the Santa Cruz stop that Mare first met CFC-member Jorge Flores. CFC is composed of three members — Flores, Juan Jose and Jay Khan — who have been integral in putting on the show. Local artists will also touch upon community issues regarding sustainability, self-care and justice for the earth. Mesha L, a community artist who raps over interstellar-sounding beats, personifies the bridge between UCSC and community. Mesha L gained notoriety for her truthful rhymes and laid-back attitude. She’s passionate about being a part of an event focusing on women in hip-hop, while continuing the fight for a sustainable way of life. “The more we get community members involved with UCSC and students involved with the community, we’ll get the changes we want to see in this area,” Mesha L said. Mesha L previously collaborated with Jay Khan, an alumnus and CFC member, who has been involved with spaces like Rainbow Theater. Khan has also participated in previous events at UCSC and is excited for the event to unfold. CFC is working on helping bring together diverse groups through creative outlets. “It’s something growing out of the community and different people who are active in different places — from politics to hip-hop, to movement building,” Khan said. The event, bringing communities like CFC and the Romero Institute together is the first of many future collaborations regarding environmental and social issues. Sara Nelson, the Romero Institute executive director, is hopeful students will participate in these climate change discussions. She is also excited for the passion that the artists will highlight with their words. Admission to “Word to Our Mother” costs $5. The show takes place Friday, April 29 at 7 p.m. at the Merrill Cultural Center.